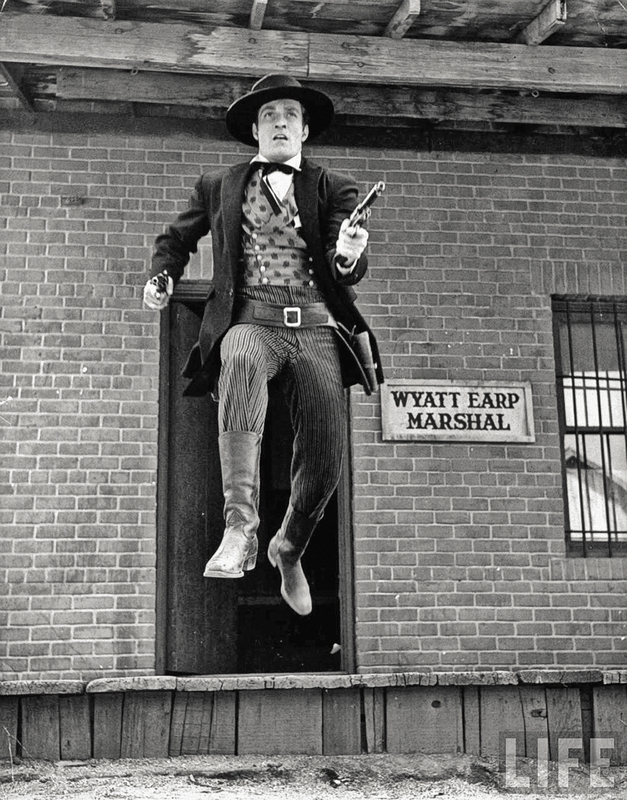 One role defined Hugh O’Brian’s acting career—the title character in The Life and Legend of Wyatt Earp. The adult Western premiered on ABC on September 6—61 years and one day before the actor passed away at the age of 91. Born Hugh Charles Krampe in Rochester, New York, he dropped out of college in 1942, at 19, to join the Marines, where he became their youngest drill sergeant. As ruggedly handsome as any man has the right to be, he embarked on an acting career in Hollywood. In 1950, he appeared in his first Western, Beyond the Purple Hills, starring Gene Autry. By his fourth year, he had won the Golden Globe for Most Promising Newcomer, for his performance in The Man from the Alamo. In 1954, Earl Holliman recalls, “We played brothers. Richard Widmark, Hugh O’Brian and I were the sons of Spencer Tracy in a picture called Broken Lance. I’d seen him on the screen; I knew he was a man-about-town and dating all the girls at Fox. I wasn’t sure I was going to like him, but we sat together on the plane to Nogales in Arizona, and he laughed at my jokes. The Life and Legend of Wyatt Earp, which aired on ABC from 1955-1961, along with CBS’s Gunsmoke, helped launch a fantastic era of TV Westerns, with as many as 40 on prime time by the close of the 1950s. “So we became friends. In those days, when you were a supporting actor, on location, you shared a room with another supporting actor. Hugh and I shared the same room. I liked Hugh; he was easy and fun to work with, had a nice sense of humor. “He was the most dedicated guy I’d ever seen. He really worked so hard on his career. Every night he would be typing letters to [showbiz columnists] Hedda Hopper or Louella Parsons or Jimmy Starr. I didn’t want to do that much work, but I really admired him for it. Louis F. Edelman produced The Life and Legend of Wyatt Earp. His daughter, Kate Edelman Johnson, recalls, “The first job I ever had was answering Hugh O’Brian’s fan mail, when I was 12. I always said to him, ‘Hugh, I can still sign your name better than you can.’ He was very, very sweet. “My dad created The Life and Legend of Wyatt Earp from his love of Westerns. He found Hugh, and it was magic. It was such a major hit, because, up until then, you had The Lone Ranger or you had The Cisco Kid, but they were made-up characters. My father bought the book by Stuart Lake. Stuart Lake had interviewed Wyatt Earp just before the lawman died in 1929. For the first couple of years of the show, Stuart Lake was alive, and he was a consultant. Tombstone in Arizona Territory is the setting for which Wyatt Earp is most famous, but from 1956 until 1959, The Life and Legend of Wyatt Earp was actually set in Dodge City, Kansas Territory­—just like CBS’s Gunsmoke. “Hugh had a great relationship with Stuart Lake. Hugh created that costume, with the flat hat and the brocaded vest and the string tie. Hugh loved the role. He got very into it; he studied it. He was that character for all those years. From 1958 to 1961, Morgan Woodward played Shotgun Gibbs in 81 episodes of Wyatt Earp, opposite Hugh O’Brian. 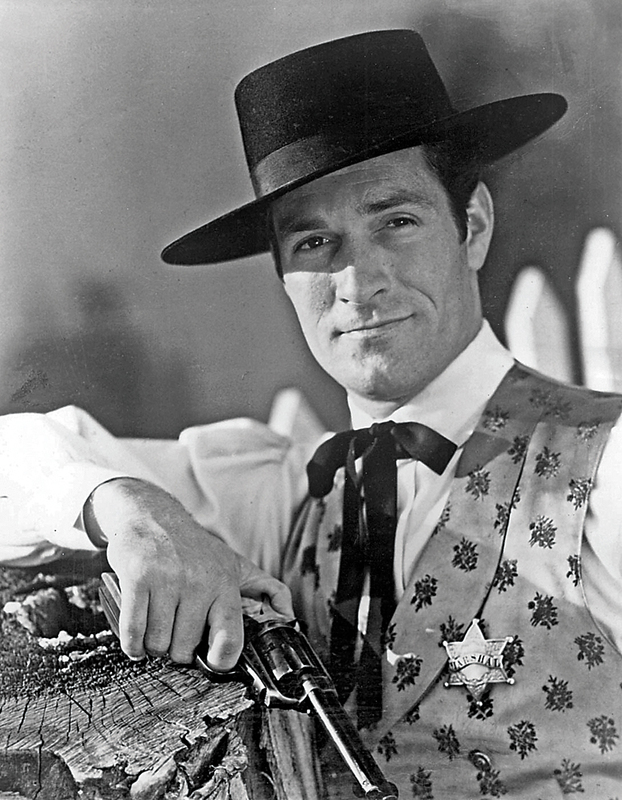 Hugh O’Brian in his role as Wyatt Earp in the ABC series. “I was with him for four years. 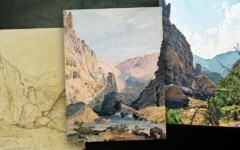 Hugh was an unusual man,” Woodward says. “He was not ‘hail fellow well met.’ When we first got on the show, Hugh let me know that he didn’t want to be upstaged, or anything like that. And of course, I’m the sidekick. I let him know that I wanted the show to last as long as possible; wanted to make him look good and make me look good. Once he got to know me, we got along alright. 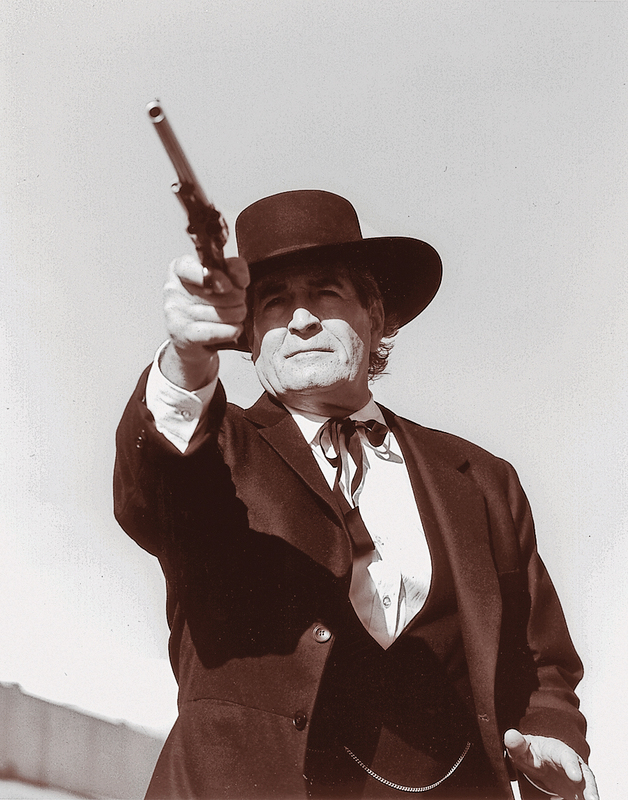 In 1993, thirty years after Hugh O’Brian had left the role of Wyatt Earp, producer Rob Word, working with Kate Edelman Johnson, persuaded Hugh to put the costume on again for a CBS movie. The idea was to mix new scenes with colorized footage from the series, to bring the story up to 1918. Tombstone had been a surprise Christmas smash, and the Kevin Costner Wyatt Earp was coming in the summer. “I figured if we called our movie, Wyatt Earp: Return to Tombstone, and ran it between them, we’d confuse the viewers, and they’d all tune in, which they did,” Word says. “We were the first and only Wyatt Earp movie ever to film in Tombstone, Arizona. Working with Hugh O’Brian was not just a thrill for me, but for everybody we met in Tombstone. Hugh was 69, and still so incredibly handsome. Bruce Boxleitner, who himself played Wyatt Earp, in 1983’s I Married Wyatt Earp, played the sheriff of Cochise County in Wyatt Earp: Return to Tombstone. Pierre O’Rourke appeared in celebrity events that showcased O’Brian as Earp. 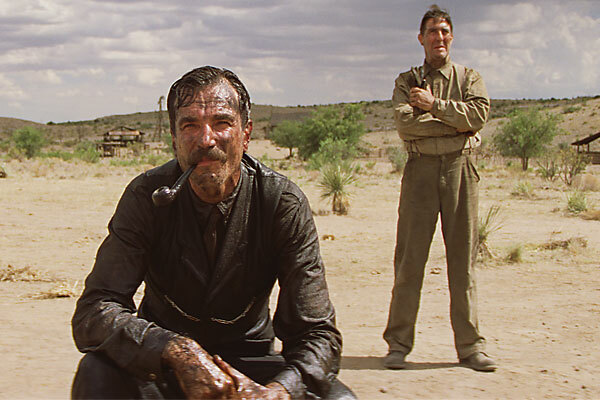 “Appropriately, I met Hugh O’Brian on a Western film set,” O’Rourke says. “I came to wonder if Wyatt Earp was much different than the legendary actor who portrayed him in The Life and Legend of Wyatt Earp. “When filming ended, Hugh took me under his wing—introducing me, in and out of costume, as his deputy for more than two decades. As his deputy, I joined him at his Fortune 500 company appearances as Wyatt. His fee went directly to HOBY, his foundation, which, in 60 years, has helped more than 450,000 sophomores around the world learn how to be more conscious in life, and to give back. “Hugh would share how a two-week stay in Africa cleaning bed pans and washing sheets in Dr. Albert Schweitzer’s leper colony, followed by deep discussions with the great man in the evenings, had left him with the challenge of, “What are you going to do with your fame and success to give back to the world?” It’s a lesson Hugh took to heart, and implanted in my heart. “Some of his friends are only a few plots away: Spencer Tracy, Clayton Moore (the Masked Man) and Errol Flynn. “A 21-gun salute honored the man who reportedly held the record as the youngest drill instructor in the history of his beloved Marines Corp.
“Hugh O’Brian will always be a part of me. Sadly, I am a deputy without his marshal. Semper Amor, my Friend. Ann Kirschner, author of Lady at the O.K. 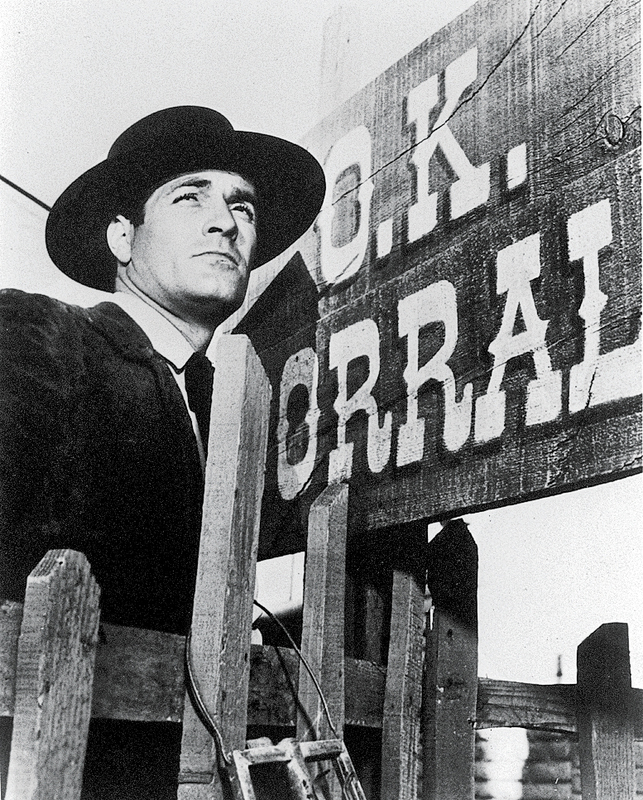 Corral, came to love the Tombstone story through watching O’Brian star as the legendary lawman. “Really, could he have been any more handsome? I fell in love with all things Earp when I fell in love with Hugh O’Brian,” she says. “Tall, rangy, the jet black hair, the square jaw….I know, I still sound like a kid with a crush. But even as a kid, I appreciated the balance of the clean cut hero with that roguish look, the slight air of naughtiness, and the always lurking prankster. 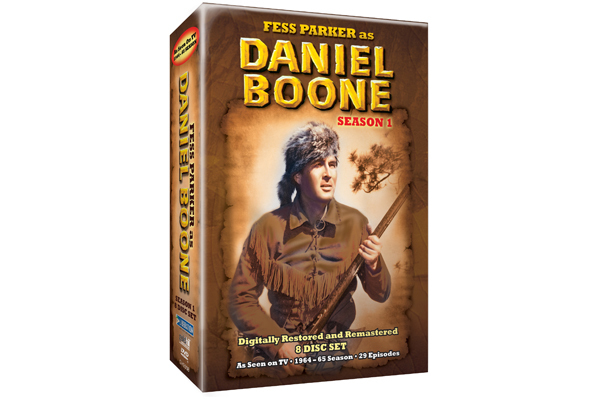 “It would be decades before I could assess the similarities and differences between Stuart Lake’s largely fictional Frontier Marshal, historical Wyatt Earp, and real-time Hugh O’Brian. They all had that lanky build and athletic grace, but alas, our Wyatt wasn’t always on the right side of the law. 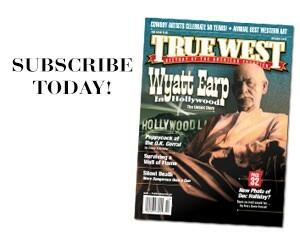 Bob Boze Bell met the actor after taking on the reins as executive editor for True West Magazine. “Hugh used to call me here at the magazine about once a week and regale me with stories about Hollywood, Wyatt Earp, all the while bending my ear about doing a story on him. He could be very persuasive, and I must admit, we obliged him more than once. 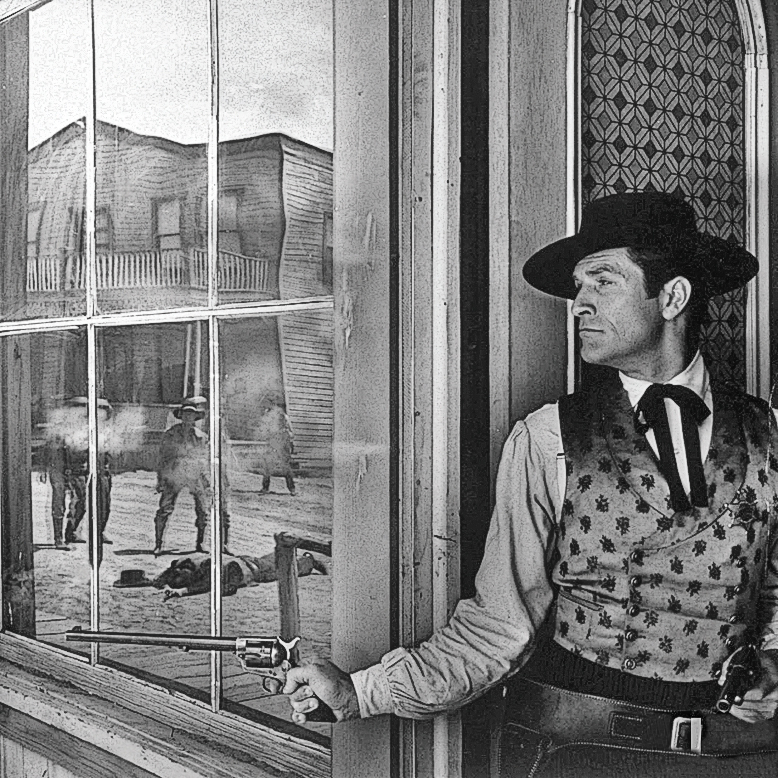 Who did Hugh O’Brian think was the best Wyatt Earp? When I interviewed him a couple of years ago, wanting to be tactful, I asked him who the second-best Earp was. “The second best? I guess it was me. The best was Wyatt himself. He was a helluva man. He died here, by the way, in 1929, on 17th Street. He lived here in Los Angeles the last three or four years of his life. He made money doing appearances and stuff. The people just west of Newhall, that huge area between there and Las Vegas, like 150 miles by 200, they put up one notice at the upper entrance. It said ‘This Property is Guarded by Wyatt Earp.’ Nobody ever came on it again,” he said, with a chuckle. Hugh was too modest to admit it, but we all know he was the best Wyatt Earp; brave, courageous and bold. Long live his fame. Long live his glory. And long may his story be told. Circling the Wagons Soul-wrenching struggles and gritty scripts earn Westerns awards and respect.